Liquid Saffire 56, FireWire audio interface from Focusrite in the Saffire series. 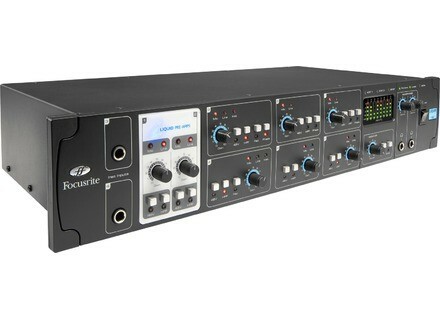 Focusrite has announced that the Liquid Saffire 56 is shipping and available in stores across the USA. The Liquid Saffire 56 features 2 Liquid mic-pre’s evolved from the original Liquid Channel. Each Liquid Pre-amp is designed to let you choose from ten different classic pre-amp emulations including the API 3124+, Neve 1073, Pultec MB-1, Telefunken V72, Focusrite’s own Red 1, and more. In addition to 8 mic pre's, Liquid Saffire 56 includes 10 analogue outputs, 16 channels of ADAT i/o, stereo S/PDIF or AES i/o (on RCA phono), MIDI i/o, 2 virtual 'loopback' inputs, for routing digital audio between software applications, and BNC wordclock i/o. The Saffire Mix Control software is designed to provide flexible control over routing and monitoring, which includes presets for immediate set up of commonly used mixing situations, and full metering across all inputs, outputs and submixes, according to Focusrite. For more information on the entire range of Focusrite products, visit www.focusrite.com. knobster Releases Slitch knobster has announced the release of Slitch, a free VST instrument plug-in for Windows for the manipulation of audio files.